Today saw the release of a brand new iOS 8.3, 8.2, 8.1.3 jailbreak by TaiG, and as ever that means that everyone who has been stuck without their favorite Cydia tweaks for far too long is rushing to jailbreak once more. But as we all know, it’s not always as simple as that. 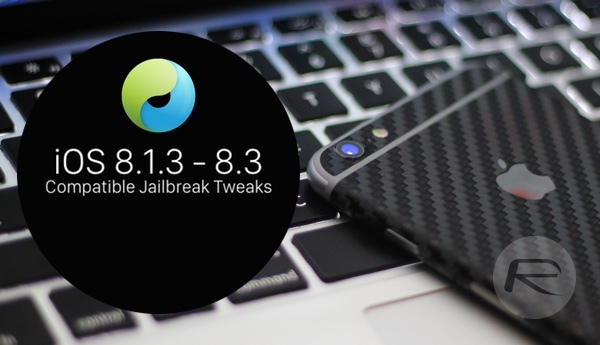 Released by the TaiG team, this new jailbreak supports iOS 8.1.3 all the way through iOS 8.3. Those who have just jailbroken are going to want to know which of their favorite Cydia tweaks and apps are compatible. Seeing as this is a brand new jailbreak and before it iOS 8.3 couldn’t be jailbroken, there could be quite the wait before those tweaks get updates. What that means is, at least in the short term, jailbreakers using iOS 8.3 may see some unexpected behavior when using certain tweaks and apps. If only there was a list of tweaks that had been tested with iOS 8.3 so that we could all just check that before we do the dirty deed ourselves. Oh, that’s right. There is! By using this list of iOS 8.3 compatible jailbreak tweaks you should be able to avoid those unwanted crashes and resprings that are often caused by a tweak that isn’t yet quite ready for the latest and greatest version of iOS. We’d certainly consult the list to make sure our tweaks are supported even before updating to iOS 8.3 because you do run the very real risk of taking a functioning jailbroken iOS device and bricking it by updating a few days too early. This release of TaiG’s iOS 8.1.3 – 8.3 jailbreak is a big one, so expect tweak makers to get their work up to speed sooner rather than later. As is always the case with these things, it’s better to be safe than sorry. This list of comaptible apps makes that mantra an easy one to follow, no matter how giddy we get at the thought of iOS 8.3 being jailbroken. This list is being updated continuously by the community. Check back for updates. UPDATE: There are now 300+ jailbreak tweaks that are compatible to work with iOS 8.3. The list above has been updated. CCControls and AskToCall are not working for me. Shrink isnt working either and I’ve purchased. To each and everyone of you who say that the apps do not work, this is the problem… 1. you downloaded the OTA update for your device and did not freshly restore your iDevice before you did the jailbreak. 2. you are downloading the apps from a mirror repo that does not have the latest build of the tweak/app you’re trying to download and finally 3. you are using an incompatible iDevice for that specific product… not everything works under the 64-bit build for the newer iDevices. cheers. The best AT&T phone ՍΝᏞΟᏟΚing service I know is just google atttiphoneuunloockiing.